CONGRATULATIONS, you found the one and now our photographers can help you find the best NYC locations for your engagement photo session! With affordable photo packages and a knowledgeable team of photographers, booking an engagement shoot is a great way to get to know our team and give you some practice time posing with your new fiancé! From great outdoor engagement locations like Prospect Park, Brooklyn Bridge Park and Red Hook, to well known indoor photo locations like Brooklyn Museum our photographers will provide you with beautiful photos. If you’re looking for a unique engagement consider NJ- based Lambert Castle ! No matter what location you choose adding an engagement session to your wedding photography package is always a great idea ! 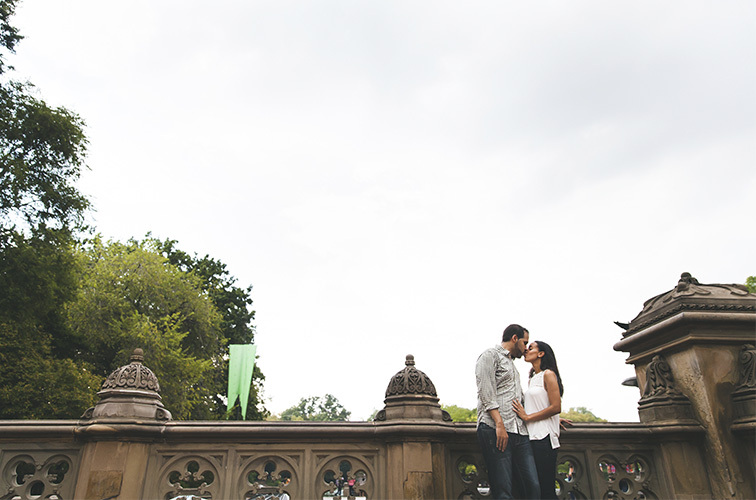 Be sure to check out Top locations for your NYC engagement shoot for more ideas! A great addition to your Engagement Photos or alone. We will create a documentary style video about your love story. At a location of your choice, we work together to come up with a storyboard. An amazing keepsake and a lovely addition to showcase at your wedding. For couples seeking a beautiful outdoor location in NYC for their engagement shoot, Prospect Park in Brooklyn is the perfect choice! 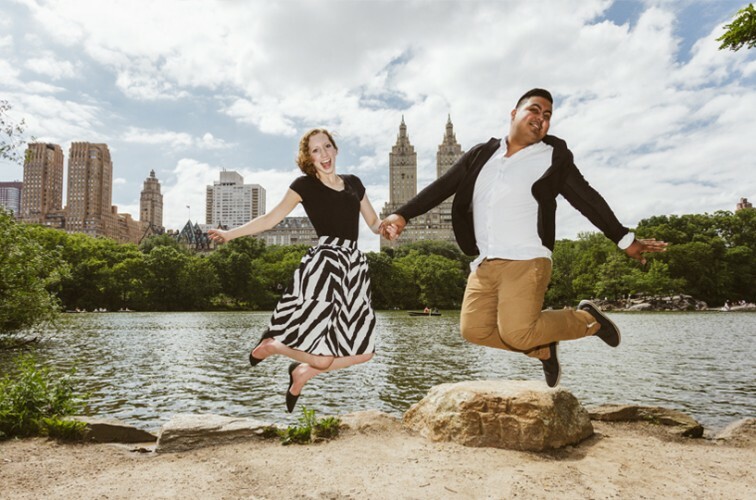 Our photography and video team love capturing engagement sessions in Prospect Park and work at the park’s popular wedding venue, The Picnic House and The Boathouse all the time. Our affordable photography packages offer couples the option to add an engagement shoot session to their package for even more savings and an opportunity to work with your photographer before the wedding day! Be sure to check out this adorable fall engagement shoot at Prospect Park for ideas on planning your NYC engagement shoot. When your engagement takes place in the winter months, having your engagement shoot in Gantry Plaza State Park or Central Park may not be an option. Fortunately for New Yorkers, there are tons of amazing indoor NYC locations to choose from that not only offer some heat from the cold but diverse artistic backdrops for your shoot! 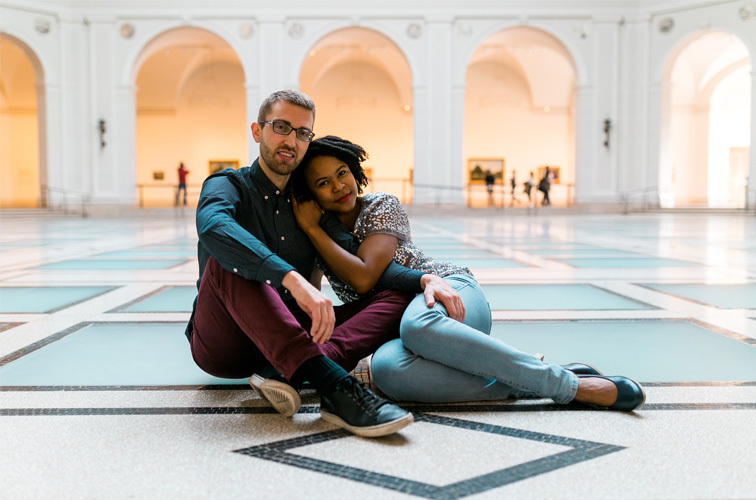 Our NYC wedding photographer joined this adorable couple for their winter engagement shoot at the popular Brooklyn Museum on Eastern Parkway and their photos came out great! The museum is packed with beautiful exhibits, artwork and open space making it the perfect location for an indoor shoot and it’s convenient Brooklyn location means not having to trek into Manhattan….double winner !!.. check it out for yourself! Arguably one of the best locations in NYC for an engagement shoot, Brooklyn Bridge Park, located in the Dumbo section of Brooklyn, is always a hit amongst our couples. The area is easily accessible by public transportation and only one stop away from downtown Brooklyn. The park offers a variety of backgrounds to keep your engagement photos interesting. Tiffany & John’s pre-wedding shoot turned out great and our photographer threw in a few black and white shots to make it even more dynamic. Check it out! Our photographers are constantly praised on their ability to capture romantic candid photos of couples on their big day. They are pros at giving just the right amount of creative direction while still allowing the couple to be in the moment and do what comes naturally. After all, you want your wedding photos to reflect your personality and really tell the story of your day through the images. While an engagement photo session is a bit different from a wedding shoot, it is still possible to get very natural, candid portraits of you and your fiancé, as you will see in this beautiful Brooklyn engagement gallery. Mai & Yin plan to marry next spring at the Brooklyn Botanic Garden and wanted an engagement shoot that reflected their easy going relationship. Our photographer captured the two in their Bed-Stuy home hanging out together and in a local park for a fun game of basketball. Their photos came out great. Check it out! 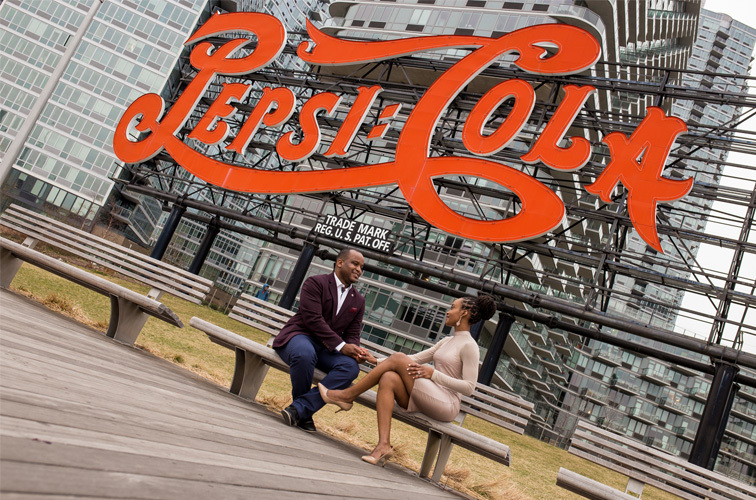 Check out this gorgeous Gantry Plaza State Park engagement shoot our photographers had the pleasure of capturing! Thanks to recent development Long Island City is now home to an array of bustling restaurants, new residential buildings and of course this amazing park offering breathtaking views of the Manhattan skyline! Kamekah & Krishna nailed it and looked great for in their engagement photos, leaving our photographers excited to capture their summer wedding next! Click “view gallery” to see the rest of this flirty photo shoot. Engagement session is here and with Cupid buzzing around our photographers are excited to start capturing more beautiful engagement sessions like this one. 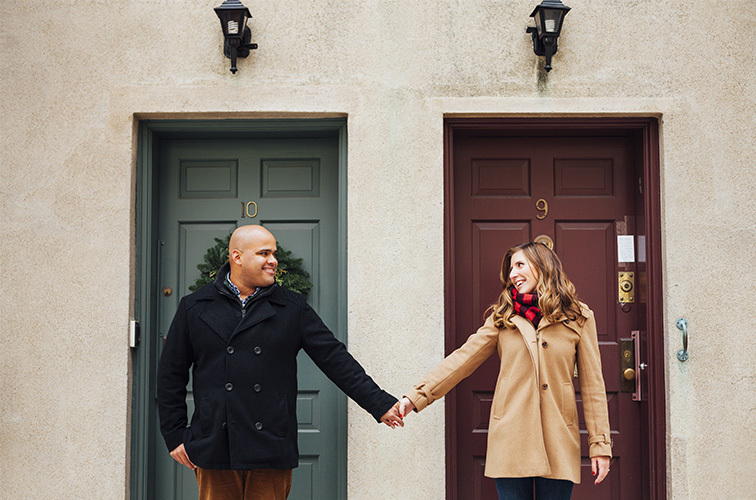 While the majority of our engaged couples choose locations like Central Park for their shoot, hidden gems like this Fort Greene neighborhood in Brooklyn should not be overlooked! They plan to get married in New Jersey this fall but wanted to keep it close to home for their pre-wedding shoot. We love how natural their photos came out and the combination of warm tones and black and whites really created a romantic tone for their gallery. Check it out! If you haven’t had the pleasure of viewing one of the classic black and white silent films from the 20’s we suggest you google “silent films” right away and check one out. While the millennials of today have been spoiled with the High Definition and state of the art audio quality used in most blockbusters, there is something very special about creating the narrative for a film in your own mind. This fun engagement love story was inspired by the classic black and white films of the Roaring Twenties and while not silent, it’s a hilarious rendition of how Anita & Alessandro met. Check it out! Fort Tryon Park in the Washington Heights section of Manhattan is an often over-looked alternative to the more popular and larger public parks of NYC for engagement shoots. The park offers breathtaking views of the Hudson and Harlem Rivers and even the GWB. Our photographers recently had the honor of capturing engagement photos of this adorable couple, Elizabeth and Luis, who we hope have started a new trend for more amazing shoots in this beautiful location…. 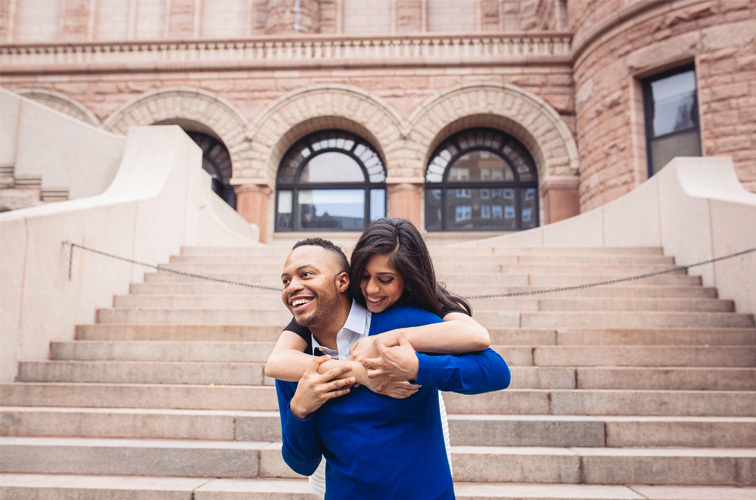 Engagement (and wedding) season is here and what better way to celebrate a promising future with your love than an engagement shoot in the city! Our photographers love working with couples and hearing about their unique love stories. Engagement photos are also a great (and popular) way to get ready for all the photos you are sure to take on your big day. Whether you are getting married in our great city or planning a destination wedding in your hometown, NYC has endless possibilities for amazing photos. 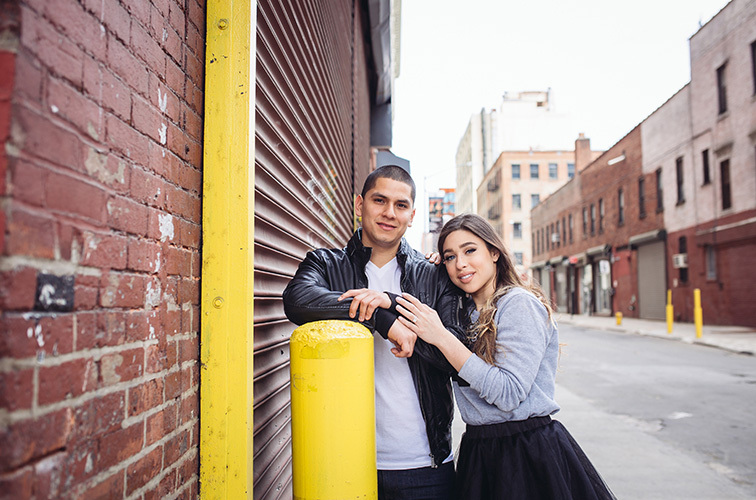 Check out this cute couple’s Brooklyn Bridge and Dumbo area shoot for ideas! You’re engaged, Congratulations! The road to matrimony will prove to be one of the most exciting journeys of your life thus far! You’ve probably taken 100 “selfies” of your ring and already changed your status on Facebook to “Engaged”, but before you pick out the dress and set the date, be sure to take some time to enjoy this special time in your life. There are hundreds of wedding blogs out there (knot.com, stylemepretty.com and brides.com to name a few) that will give you tons of ideas about what to do after you’ve accepted a proposal, however there are some suggestions for what-not-to do after you get engaged as well that may save you some time (and money) in the process. 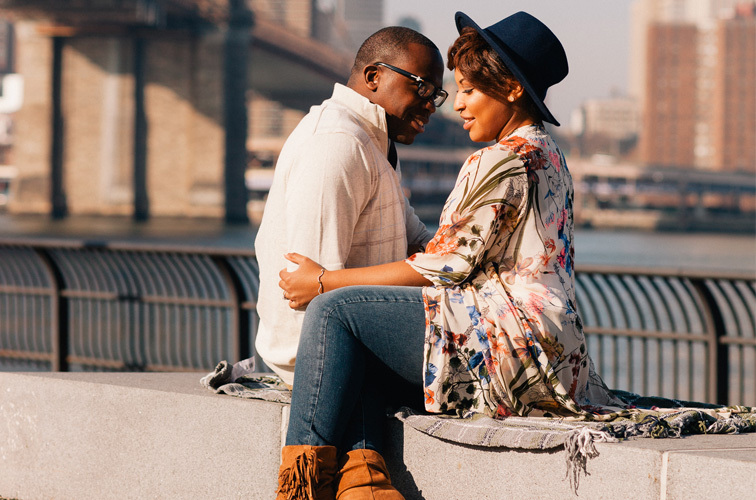 Check out this Brooklyn engagement shoot our photography team captured of an adorable couple who knows the value of taking some time to enjoy the moment! Prospect Park is beautiful in the fall! The tree leaves have changed from green to an amber hue, the ponds are quiet and it’s not as crowded as the summertime. You’ll find elderly people sitting on the park benches reading the morning paper, tourist taking “selfies” in front of the beautiful fountain in Grand Army Plaza and of course engaged couples having their photos taken by our awesome team members! Our photographers had a great time shooting this animal loving couple, Lana & Utka this past fall and they even brought along their adorable cocker spaniel puppy (he will serve as the ring bearer for their springtime Bronx Zoo wedding). Come rain or shine, New Yorkers keep it moving! As was the case with this fun summer engagement shoot in Astoria Park. Yasmeen and Alex, a playful (and insanely good looking) engaged couple decided to go ahead with their shoot even though the forecast called for a few shower, and as you will see it was a good call! The park offered beautiful views of the East River and quiet areas for them to walk and even dance on the lawns. Our photographer had a great time shooting this pair and we look forward to being part of their wedding day! A great way to personalize your engagement photos is to bring in elements that are special to you as a couple. Our photographers have had a blast shooting couples playing football on The Great lawn in Central Park (in opposing team jersey’s of course), in the NYC transit museum (they met at work as MTA employees) Madison Square Garden (on the hockey ice!) and even in the book lined aisles of Strand for our avid readers (great discount bookstore in Union Square by the way). Whatever it is that makes you special as a couple, incorporating that into your engagement shoot is always a great idea and makes for great photos. So don’t overthink it, just do what comes naturally and your photos are sure to be perfect as was the case with this adorable couple, Dyesha & John. NYC is home to more than 1700 public parks, 4 Botanical Gardens (the Japanese Hill and Pond Garden is a must see!) 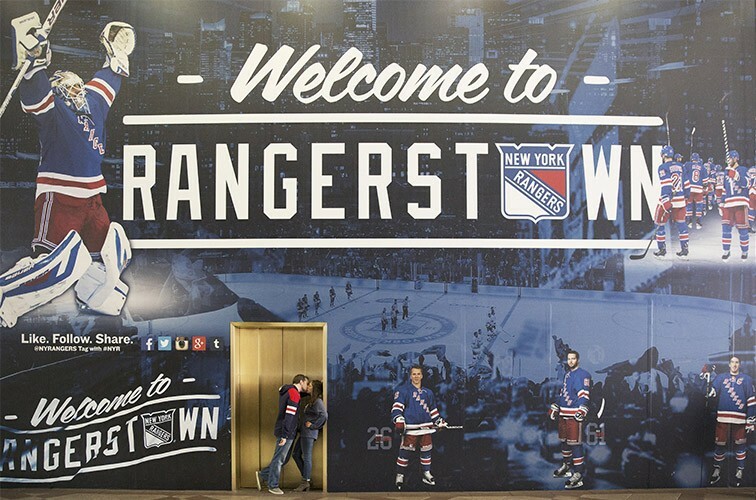 83 museums and a host of recreational facilities and community spaces throughout the 5 boroughs. 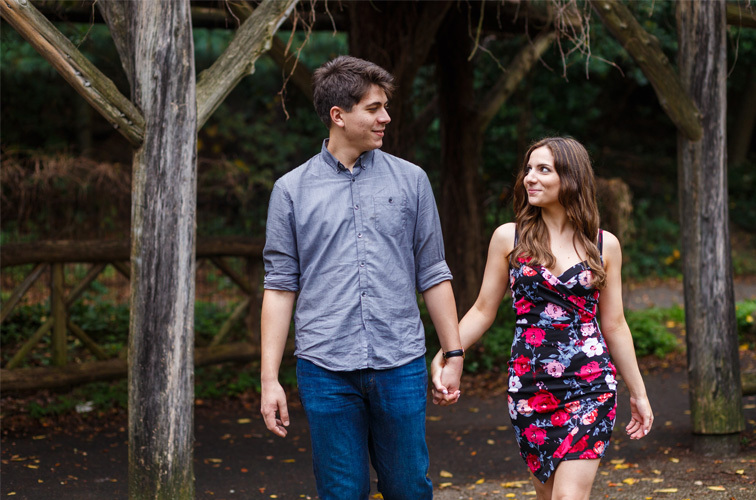 Couples can pick from wetlands, woodlands, rolling hills and breathtaking views for amazing engagement photos all within the City of New York (and easily accessible by our extensive subway system)! Our team has had the pleasure of shooting at many of these great locations and were thrilled to join Julie & Mike this past winter in Greenwich Village for a fun shoot at Washington Square Park. These stylish Canadian love birds choose to strut their stuff in Central Park with a romantic spring engagement shoot. Both lovers of fashion, they were naturals in front of the camera. Kristie wore a bold black and white A line skirt, while her fiancé, Luis opted for Khakis and a blazer. They took photos throughout the iconic park and turned a lot of heads! A long way from home, Kristie & Luis wanted a New York City theme for their engagement photos and accomplished just that! 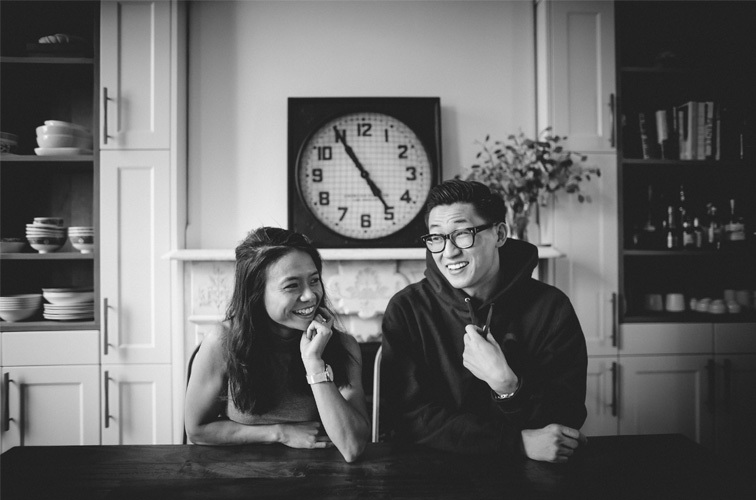 Our photographers, also experienced in fashion shoots, felt right at home with these two! A great addition to engagement photos is the trending engagement video, also known as The Love Story. It gives engaged couples the opportunity to let their imagination run wild and showcase their unique love story. 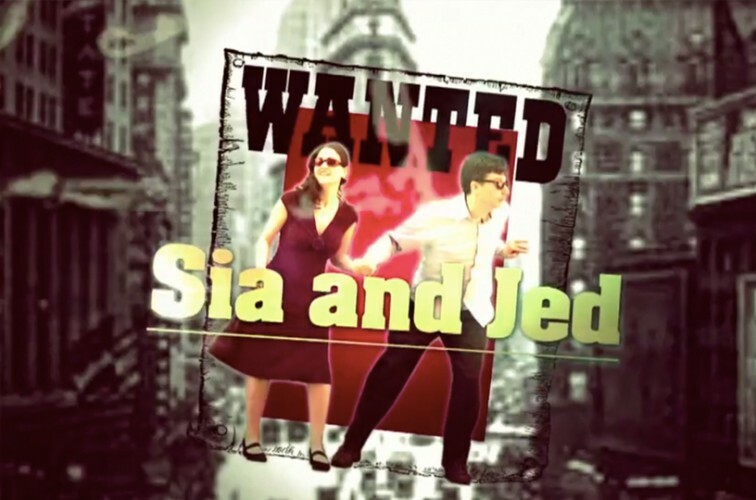 Who knew that Sia & Jed met as bank robbers! This fun loving couple pitched this idea to our videographers and we loved it! Shot in the Dumbo section of Brooklyn, even the owner of the famous Spanish restaurant on Jay Street, Pedro’s was willing to get in on the story! Engagement shoots are a great way to get to know your photographer as well as get comfortable in front of a camera with your fiancé. Patricia highly recommends that all engaged couples do it! They decided to have their shoot in Earl’s Brooklyn Heights neighborhood. Howard University graduates, they wanted to showcase their casual fun side in jeans and flats and their polished professional side in a little black dress and suit. The Le Image team will also be there when these two say I DO! Vanesa & Hussein kept it traditional in their Love Story engagement video and talked about how they met and what they love about each other. Our videographers guided this couple through the Dumbo, Brooklyn area and Brooklyn bridge park to record their narratives. Vanessa loves how spontaneous Hussein is and Hussein is enchanted by his future brides beauty. Our team looks forward to creating a beautiful wedding video for them as well. This couple is proof that opposites do attract! They met when working together and didn’t hit if off right away, but learned to celebrate their differences. Michael & ana shared their Love Story with our team of videographers in preparation for their wedding day. Their engagement video is both funny and romantic! Gail & Mozart took their love to new heights with their engagement shoot at High line park in Manhattan, NY. Mozart loves his fiancé’s style and gave our photographers great direction on how he wanted the shoot to go. This cute couple had some fun and took barefoot photos in the sprinklers, ate cupcakes together and shared a cool drink. They plan to keep up the outdoor theme and marry in Central Park in front of Bethesda fountain. Our team will be there with (wedding) bells on!